Critical Thinking Blog: All Opinions Are Not Equal: Why is Abortion a Religious Issue? You're right. Its not faith, more natural law, which all people can realize through reason. But it destroys arguments like Joe Biden's, who says that he accepts that life begins at conception as a matter of faith, but is pro-choice because he doesn't want to "force" that view on others. He doesn't seem to respect life too much if he thinks its OK for other people to destroy it. Kind of like saying I'm against slavery, but wouldn't force that view on others. actually, for someone who believed life begins at conception but is still pro-choice, wouldn't that be just like saying you're against murder, but wouldn't force that view on others? Abortion or for that matter any other questions that put humans into dilemma, shouldn't they be resolved by individuals. Each decides according to his / her situation. But guess since humans have a history of messing up, religion steps in and tries to decide for all. But then religion is a human creation too and quite unnecessary and intrusive. that is a great example of the generic arguments we're trying to get past, and think about why we believe what we believe. I've never quite been able to figure this one out, but I think its because some scriptures seem to speak to the issue - like the Bible - with passages like "I knew you before I formed you in your mother's womb?" In terms of Biden et al, its absolutely like saying you're against murder but wouldn't want to force that view on others (except that in most cases of murder the victim isn't growing inside the perpetrator, but that's not entirely germane). Kinda illogical. So now the question is if abortion were outlawed whether we would sentence the million or so women (okay, let's say 500,000 because some will be deterred by the law), their doctors, and any accomplices (husbands, children, parents, etc) to life in prison or if we'd (ironically) give them the death penalty. So to speak to the question, I have a hunch that religion influences the public discourse way more than it actually influences the actual beliefs of people. If folks _really_ believed that life begins at conception we'd hear way more conversations about building new women's prisons after Roe v Wade is overturned. But folks aren't willing to go there...nor are they willing to have full-scale funerals for their miscarried 4-week-old embroyos. Maybe we've all got a little biologist in us. One of many spiritual questions that are actually biological ones. Interesting post, though I would call into question your original statement of "It's a biological question." Frankly, the biology of the question is not unknown, at least in recent memory. To say that the question "What constitutes a human?" (which is the larger question here) is biological in nature is fundamentally flawed. It's like saying that the issue of "Hate Crimes" is fundamentally a genetics problem. Genetics may be useful in describing the particulars of the problem, but are not at all useful in finding the root or the solution to the problem. And so we come back to abortion. Because biology cannot inform how we determine who is human and entitled to rights, the lines that we draw (conception, heartbeat, delivery, independence) are completely arbitrary. Biological sciences do nothing to help that impasse. Because of this, people must appeal to some greater authority to make their case. And that takes us to religion. "It's not my opinion, it's God's opinion!" even if biology won't help get us pass that impasse, i argue that it will at least help move the debate to a better place. As we continue to gain understanding of the biology that takes place that creates life, we are better able to conclude when that life is actually created, and therefore, would gain human rights. Just like 3-D sonograms are influencing abortion decisions as women go, "holy crap, this thing's a real person", I think a deeper biological understanding could have the same result. Abortion always becomes a religious issue secondary to the problem of our opinions clouding our understanding or acceptance of the science. 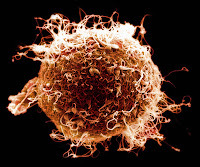 Unfortunately, biology does not give us a hard fast line to say, "Here is where life begins." So we use our beliefs on life and the evidence, whether biology, scriptural, or anecdotal, that agrees with us to argue what we believe to be true. The problem comes because some people rely on the same arguments for either side, i.e. the argument of Love. I love people so much that A)the baby should live and there is no reason that it should be aborted. or B) the pregnant women should be able to make what ever choice she wants and I will support here regardless. It is so much a 'religious' issue because that is where our heart/mind/soul usually goes to to make and defend our most important virtues and stances like life and love.